I’m not only a video game fanatic, I also love to play board games and do so regularly with friends and neighbors. If you’re like me, you probably know that some board games work for parties and some simply don’t. To help you get rid of the duds, here’s my short list of 10 of my favorites ranging from kid party board games all the way to some more irreverent games for adults only. is not your typical card game. 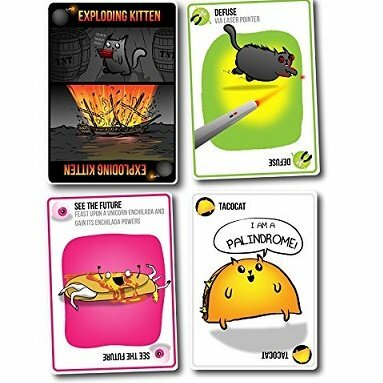 No, it’s not another Apples to Apples remake, it’s a game for people who like kittens, explosions, laser beams, and occasionally goats. Ok, that probably doesn’t make sense to you if you’re new to the game, but it’s the best way to understand what it’s all about. While there are a few rare defuse cards the deck itself can be manipulated by other cards you get that shuffle, skip, and even attack. Overall, it’s a game that’s fun on occasion and even reverent enough to play with your kids. It’s also great to bring out among unsuspecting victims at your party. We recently bought this game for my son’s birthday and were glad we did. It’s these type of easy-to-learn and fun games that party-goers really enjoy. The rules are simple, draw a card and then bounce the balls to the center to make the shape on the card. The first team that does so gets a point. Earn 3 points and your team wins. There’s also various other rules to the game you can play that extend the game beyond the basic level. 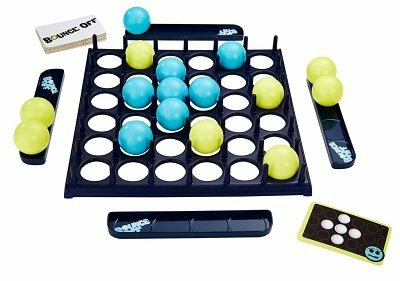 These include one mode that changes the rules to allow all players to bounce the balls at once or a head-to-head competition. Overall, it’s a novelty like most party games, but one we occasionally bring out of the closet for some easy fun. For $10, it’s well worth the price. Think you’re smarter than your friends and want to prove it? Now’s your chance, or at least your chance to prove you’re better with numbers. Wits and Wagers asks players a simple question like “How Many Native Americans Were at the First Thanksgiving Feast in 1621” and asks them to pick between one of many numbers, chosen by players, in order to come up with the number that’s the closest. It’s simple, if you’re the closest, you’ll win. The strategy comes in when you hedge your bets with the various meeples that you have. Are you confident enough to put all your meeples on one number or do you spread them out? 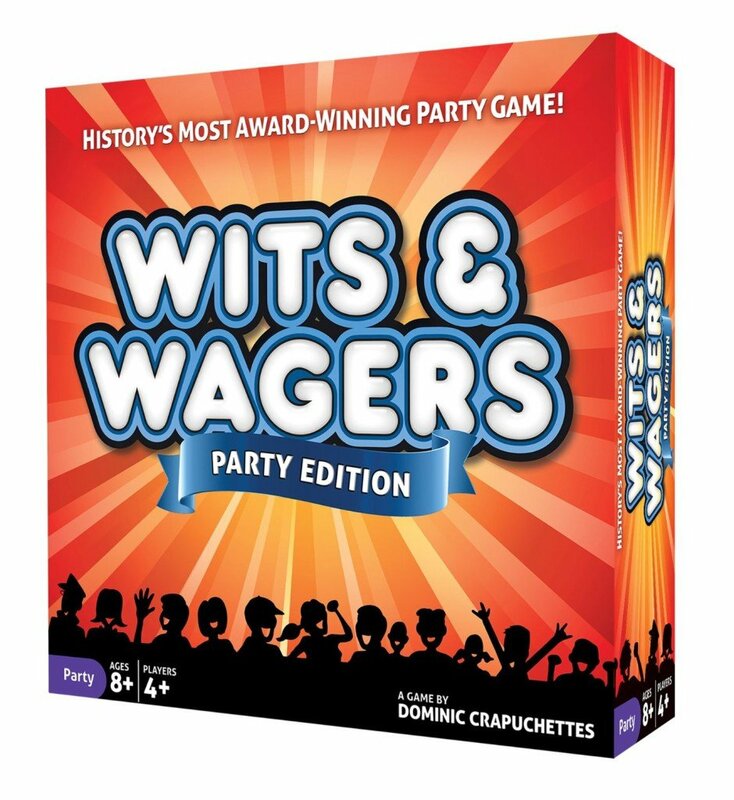 Overall, Wits and Wagers is a fun game while questions are still new. There are various expansion editions that allow you to increase the number of questions, or you can do like we have and make up a few funny questions for the party night. Either way, it’s worth the $15 cost for hours of fun. 5-Second Rule is a game that came out a few years ago that works well with adults, kids, and just about anyone. You’re asked a simple question like “name 3 yellow foods.” Before five seconds is up you have to be able to answer the question. The reason it’s so fun is that players tongues get tied and they start spitting out whatever comes first to their minds. Overall, it’s a game that’s both simple and fun and one that’s definitely good to bring out in a party or trip. Although the game lists 3 or more players, you can make up your own rules easily for 2-person play as well. I first played this game with my kids with the kid version. Most people are familiar with the basic rules but if you aren’t here’s how it works. All players are given a card which stays above their heads and have to use a series of questions to find out what the card is before the timer runs out. That being said it’s a game that can be quite difficult if you don’t change the rules. If you use the original rules, you might find yourself stretching to extend the timer a bit. This is necessary when the persons, places, or things that are on the card can quite literally be anything. Taboo is a classic game that’s still perfect for parties. If you haven’t played it before, you definitely should. If it’s been a while, then it’s always worth coming back to. Within Taboo are words that teams are supposed to guess. One of the players on your team gets a card and then uses the best words that they can to describe their keyword. The only problem is, there are certain words they aren’t allowed to use that make it more difficult for team members to guess the word at hand. The fun comes in racing against time and often saying the Taboo words that others buzz you on. 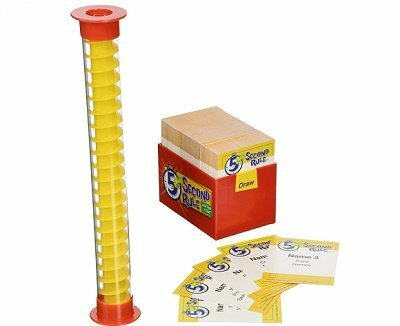 As it’s so easy to play it’s ideal for parties and a must-have for any board-game lover’s collection. Number four on our list is a bit less conventional than some of our other games, but I feel is well deserving a place in our party board games list. Not only is it a good game, it’s convenient as it’s right on your phone and as such it updates regularly. First you choose from a variety of categories including act it out, animals gone wild, superstars, accents, just for kids, and more. Then you place your phone just above your head. 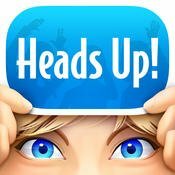 As the game begins your friends give you clues to help you figure out what the word is on top of your head. If you’re having trouble with the word you can pass by flipping the phone upward or flipping it downward if you get it right. From there, you see how many clue words you can guess in 60 seconds. Overall, it’s a great game to play through the app, or if you’d rather, you can buy the board game version. This is a newer board game that feels a lot like Encore. The objective of the game is to move your piece ahead of all other opponents to the end of the board. In that sense it’s pretty basic, but the spontaneous nature of the game makes it a lot of fun for parties. You start off by filling out a “hitlist” with a random word from any number of songs you know. Players then take turns saying a trigger word from their hitlist and the first person that bursts out in a song that contains that word gets to roll the dice and begin advancing around the board. 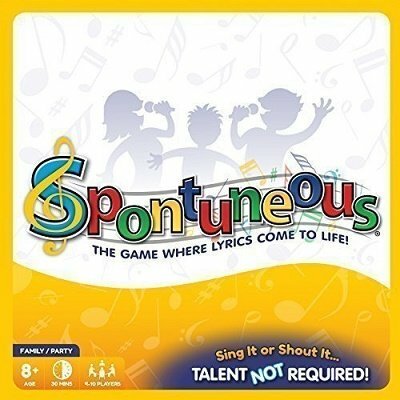 The object of the game is to not only sing a song before other players, but also come up with words that no one can think of a song for. If no one guesses your word, you’re required to sing the song you were thinking of. If you can’t, you’ll be forced to move backwards. Overall, it’s great in a crowd of people willing to sing, but falls short if you have a shier group. For those who break out in song a lot, it’s definitely worth a try. This game became extremely popular after being shown on the Ellen Degeneres show. Questions like, “Never have I ever joined the mile-high club” are given and then players must respond with “I have” or “I have never”. This game is a great way to get to know even people you’re very familiar with on another level. Not only that, because some of the questions are a little bit uncomfortable, it makes for a lot of fun. This game can be played as a drinking game, with the actual board game, or in a variety of other ways. Since we don’t drink we like to play it by having everyone hold ten fingers up and then take one finger down once one member of the party says a question that has happened to them before. This gets to be a lot of fun as you try to get friends out that you’re familiar with and know have done certain things. Overall, it’s a great game that you can play in a variety of ways and perfect for just about any party. It’s hard to take any list seriously that doesn’t include the number one game in our list. Yes, it’s unruly and no, you probably won’t want to play this with your Mother. In fact, if you’re offended easily, I highly recommend you move on to the next game in our list. 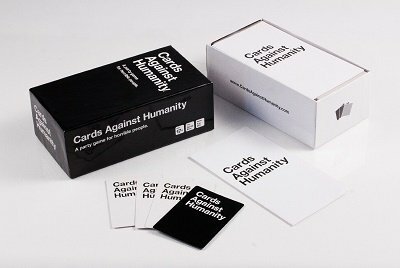 is probably the most popular party game I’ve ever seen for those very reasons. The card game, as well as its six expansions take up 7 out of Amazon’s 10 best sellers in games. The starter game comes with 550 cards while expansions come with an additional 100 cards each. So, what makes a card game like this such a popular party option? It is after all a game for horrible people, or so it says on the box. Honestly, it’s this same irreverence and twisted sense of humor that makes it so appealing for some. For how it’s played, a judge asks everyone a question which is then answered by the rest of the group. The players then choose the best white card in their hand to answer the question. This is done in a rather edgy, vulgar, or even explicit way that brings the strangest combination of terms together you’ve ever heard. Overall, these are some of the better board games I’ve come across. I’d appreciate if you take the time to vote for your favorite and comment below. And as we normally bring out many of these board games during our holiday white elephant parties you may want to take a look at these white elephant gifts as well. 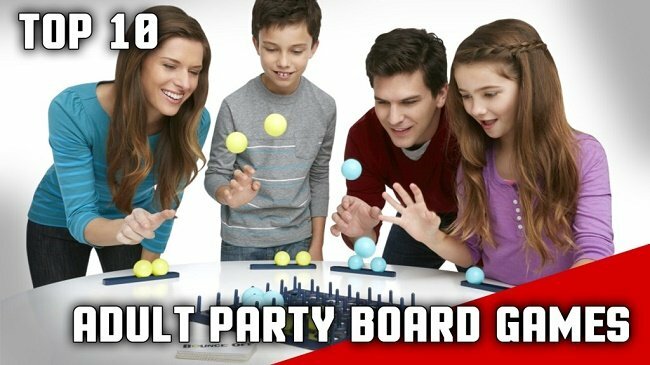 What's the Best Party Board Game?